Try two trial issues of The Atlantic with our compliments. 125 years after his birth, the author known for his eerie tales—and his racist beliefs—has had one of the biggest comebacks in Western literature. American history is filled with writers whose genius was underappreciated—or altogether ignored—in their lifetime. Most of Emily Dickinson’s poems weren’t discovered and published until after her death. F. Scott Fitzgerald “died believing himself a failure.” Zora Neale Hurston was buried in an unmarked grave. John Kennedy Toole won the Pulitzer Prize 12 years after committing suicide. But no tale of posthumous success is quite as spectacular as that of Howard Phillips Lovecraft, the “cosmic horror” writer who died in Providence, Rhode Island, in 1937 at the age of 46. The circumstances of Lovecraft’s final years were as bleak as anyone’s. He ate expired canned food and wrote to a friend, “I was never closer to the bread-line.” He never saw his stories collectively published in book form, and, before succumbing to intestinal cancer, he wrote, “I have no illusions concerning the precarious status of my tales, and do not expect to become a serious competitor of my favorite weird authors.” Among the last words the author uttered were, “Sometimes the pain is unbearable.” His obituary in the Providence Evening Bulletin was “full of errors large and small,” according to his biographer. Nowadays, it’s hard to imagine Lovecraft faced such poverty and obscurity, when regions of Pluto are named for Lovecraftian monsters, the World Fantasy Award trophy bears his likeness, his work appears in the Library of America, the New York Review of Books calls him “The King of Weird,” and his face is printed on everything from beer cans to baby books to thong underwear. The author hasn’t just escaped anonymity; he’s reached the highest levels of critical and cultural success. His is perhaps the craziest literary afterlife this country has ever seen. Which isn’t to say Lovecraft’s reanimation is simply a feel-good story. His rise to fame has brought both his talents and flaws into sharper focus: This is a man who, in a 1934 letter, described “extra-legal measures such as lynching & intimidation” in Mississippi and Alabama as “ingenious.” On the 125th anniversary of Lovecraft’s birth on August 20, 1890, the author’s legacy has never been more secure—or more complex. 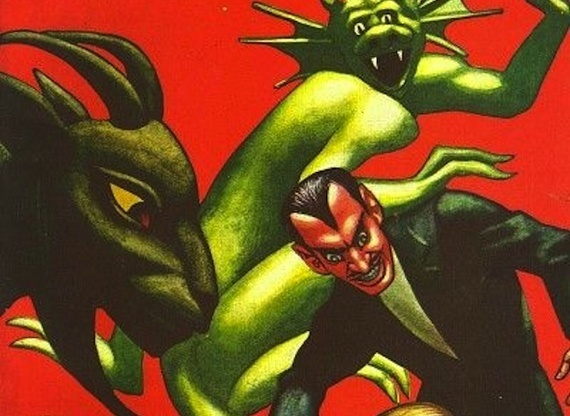 Stephen King calls him “the 20th century’s greatest practitioner of the classic horror tale,” and yet Lovecraft was also unarguably racist—two distinct labels that those studying and enjoying his works today have had to reconcile. Lovecraft never really held an office job; he was too proud, or possibly too fragile. (Various anxieties and ailments precluded him from attending college or participating in World War I.) He spent much of his time writing, and, as a child prodigy who continued scribbling until his “death diary,” he left behind a mountain of work. He wrote hundreds of poems and scores of essays, the most famous beginning, “The oldest and strongest emotion of mankind is fear, and the oldest and strongest kind of fear is fear of the unknown.” He wrote tens of thousands of letters—nearly 100,000, according to some estimates. But even as Wilson derided his work, the author’s fans and friends hustled to get his work into print. As the Lovecraft biographer S.T. Joshi recounted in a 2013 speech, one young fan took a bus ride from Kansas to Rhode Island after Lovecraft’s death to ensure that the author’s papers were donated to Brown University. Other friends launched a publishing house, Arkham House, with the express purpose of publishing Lovecraft’s stories. But Lovecraft’s critical comeback is only half of the story. The other is his conquest of popular culture. Lovecraft ranks among the most tchotchke-fied writers in the world. Board Games. Coins. Corsets. Christmas wreaths. Dice. Dresses. Keychains. License-plate frames. Mugs. Phone cases. Plush toys. Posters. Ties. Enterprising fans have stamped the name “Cthulhu” (Lovecraft’s most famous creation; a towering, malevolent, multi-tentacled deity) or other Lovecraftian gibberish on nearly every imaginable consumer product. And it’s not just merchandise. It’s apps and movies and podcasts. It’s a bar in New York City called Lovecraft. It’s a parody musical called “A Shoggoth on the Roof.” It’s a celebrity fan club that includes Guillermo Del Toro, Neil Gaiman, Junot Diaz, and Joyce Carol Oates. It’s Lovecraft festivals in Stockholm, Sweden; Lyon, France; Portland, Oregon; and Providence. Speaking of Providence, where I live, the town has recently shaken off decades of apathy toward its literary superstar. Providence now has an intersection named for Lovecraft, a Lovecraft bust, Lovecraft walking tours, Lovecraft read-a-thons, a Lovecraft story-writing contest, and an endowed fellowship at Brown University “for research relating to H. P. Lovecraft, his associates, and literary heirs.” Last month brought the opening of a Lovecraft-themed “weird emporium and information bureau,” where you can buy “CTHULHU FHTAGN” t-shirts and “I AM PROVIDENCE” bumper stickers. Last year, a petition demanding Octavia Butler replace Lovecraft as the face on WFA trophies received more than 2,500 signatures. A counter-petition soon followed, titled, “Keep the Beloved H.P. Lovecraft Caricature Busts (‘Howards’) as World Fantasy Award Trophies, Don’t Ban Them to be PC!” Similar exchanges play out regularly on the many social media pages dedicated to Lovecraft. In this light it is possible to perceive Howard Lovecraft as an almost unbearably sensitive barometer of American dread. Far from outlandish eccentricities, the fears that generate Lovecraft’s stories and opinions were precisely those of the white, middle-class, heterosexual, Protestant-descended males who were most threatened by the shifting power relationships and values of the modern world. Why haven’t we found extraterrestrial life? It might be because we think it looks like human life. Philip Eil is a freelance writer based in Providence, Rhode Island, and an adjunct instructor in literary arts at the Rhode Island School of Design. His work has appeared in Salon, The Jewish Daily Forward, and Rhode Island Monthly. For all the turmoil, turbulence, and sheer reality-show melodrama of the 2016 presidential campaign, the actual results appear more likely to deepen long-standing trends in the electorate than to shatter them. That’s been one of the paradoxes of this extraordinary election year. With both Donald Trump and Hillary Clinton facing unfavorable opinions from a majority of the voters, this has been a demolition derby of a campaign that has left both sides sputtering toward the finish line with dented fenders and cracked windshields. Yet a race that has unfolded like no other still appears on track to reinforce and intensify the trends that have defined the competition for the White House over the past quarter-century. The Republican nominee barnstorms through the last day of the election with a speech every bit as unpredictable and puzzling as the rest of his presidential campaign. RALEIGH, N.C.—Most presidential candidates like to end their campaigns on a positive note, thanking their supporters, delivering inspirational rhetoric, and encouraging voters to think that whatever the result, they’ve made a difference. Then again, most presidential candidates are not Donald J. Trump. The Republican nominee has been using variations on this line for some time now, but it hasn’t gotten any less strange. While it is intended as motivation to vote, it can also seem like he is passive-aggressively sniping at his fans, a petulant child fuming in the face of a possible loss. Yet his crowds seem to love it. Career politicians like Mitt Romney or John McCain may be willing to see defeat as just part of the game—win some, lose some—but to Trump’s supporters his all-or-nothing attitude just shows that Trump is not a politician, and he’s playing because he thinks it matters to the fate of the nation. A civic duty to stop Donald Trump requires that I support a candidate I could’ve never imagined backing. All my voting life I’ve been dissatisfied with the candidates put forth by the major parties. I’ve cast reluctant ballots for Republicans, Democrats, Libertarians, and even write-ins. There’s never been a contender whose preferences were close to mine. In 2012, I published a widely shared article, “Why I Refuse to Vote for Barack Obama,” that argued against holding one’s nose that year and voting for the lesser evil. Disillusioned by President Obama’s unconstitutional intervention in Libya, his secretive drone killings (even targeting an American), and his failure to rein in mass surveillance of all Americans, I wrote that while I wasn’t entirely sure whether Mitt Romney would be better or worse, I would cast a protest vote for Gary Johnson. A new approach to a once-farfetched theory is making it plausible that the brain functions like a quantum computer. The mere mention of “quantum consciousness” makes most physicists cringe, as the phrase seems to evoke the vague, insipid musings of a New Age guru. But if a new hypothesis proves to be correct, quantum effects might indeed play some role in human cognition. Matthew Fisher, a physicist at the University of California, Santa Barbara, raised eyebrows late last year when he published a paper in Annals of Physics proposing that the nuclear spins of phosphorus atoms could serve as rudimentary “qubits” in the brain—which would essentially enable the brain to function like a quantum computer. Some neuroscientists are trying to change school and work hours that discriminate against night owls. That could mean, for example, that when the world is saying it’s time for bed, you’re not tired. When the world is saying it’s time for work, you’re sure you need more sleep. A growing number of experts believe that this phenomenon is real, common, and beyond our control—and that the health consequences are serious. Among them is Judith Owens, a Harvard faculty neurologist and director of the Center for Pediatric Sleep Disorders at Boston Children’s Hospital. She believes that morning people need to do more to recognize and respect the biology of non-morning people—who may simply not be built to operate on traditional schedules. Humans have lived in what we now call the American Southwest for centuries, making a wide impact on the land, much of it visible from aerial and satellite photography. Nuclear detonations, housing subdivisions, oil exploration, hydroelectric facilities, solar power facilities, roads, mines, farms, ranches, cities, and towns have altered much of the land over the years. Over the past week, I took a virtual tour with Google Earth, and wanted to share some of these snapshots of the human landscape in Arizona, New Mexico, Colorado, Utah, and Nevada. Hillary Clinton’s candidacy has catalyzed a level of intense misogyny that probably won’t go away. The decline of a once-powerful majority is going to have profound implications.
? Subscribe to ​the Daily​, our free weekday email newsletter. Get 10 issues a year and save 65% off the cover price. Copyright © 2016 by The Atlantic Monthly Group. All Rights Reserved.